Nothing puts a smile on my face like turning up at the restoration shop and seeing the guys hard at work on your classic. After a few chats on the phone with Brain at Joscar there were a few things I needed to drop off and it would also afford me the opportunity to see what they have been up to since my last visit. I wasn’t harbouring high hopes of much movement as the last time I was there the shop was full of cars and the guys were looking a bit stressed with the impending workload. A Corvette was ready for paint, a Mustang was causing major grief with some dodgy ill fitting Asian replacement panels and along with an assortment of tri five Chevy’s the place was busting at the seams. When I arrived a number of the cars had been completed and were gone. 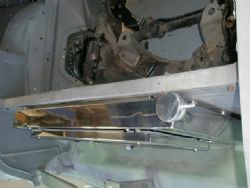 The Nomad had pride of place with all the panels refitted, the dash temporarily screwed in and the radiator mounted. After a brief chat and dropping off the stuff I perused the work that had been done. The radiator is a piece of art and I was extremely happy with how it looks, how it fits and I have no doubt that it will perform its job admirably. I did the mandatory due diligence in sourcing the radiator and checked out all the local options first. There are a gamut of local suppliers that can sell you a radiator off the shelf or custom make you one. After consultation with a number of shops, talking to different people at events and personal preference everyone qualified out. One of the main suppliers stuck their logo all over the front of the radiator which left me cold and clammy and another who sells quite a few locally got bad raps from a number of people regarding quality, service and fit. I could have gone the Commodore option to match it up with the LS2 engine but my personal preference was polished aluminium and there are a number of suppliers in the US that build specifically for engine combinations in tri five Chevs. 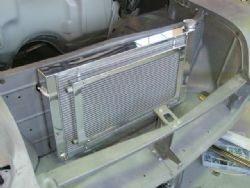 I spoke with all the major suspects including Griffin and Be Cool regarding their offerings and then I stumbled upon an article in Classic Chevy magazine that had a wicked looking radiator from a mob called Mattsons. They say first impressions mean a lot and their response to my phone call covered all and more than I was looking for. Rather than giving me a pitch, a dozen questions were asked of me in what I was looking to do and they pointed me to their website to check out the various options, of which there were plenty. In stock too. Ready to ship. With the advice that you can never have too much cooling I went with the big block option specially set up for an LS2 swap with the pipes coming out one side to marry up cleanly under the hood. It also has the air conditioning cooler integrated out front and was supplied with all necessary hoses, dual fans, overflow bottle and bits. Of all the options I looked at it was probably the most expensive and it came extremely well packed in a solid box full of expander foam so the first time I saw it was at Joscar mounted to my support panel. It was worth it. It looks the ducks nuts. 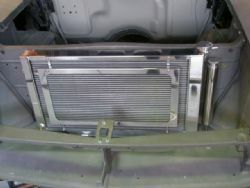 It fits superbly and has a built in panel at the bottom to match the Chev radiator support that forces all the air coming through the grille into the radiator. 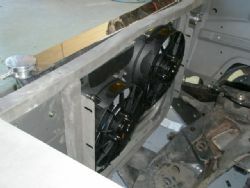 It mounts on the outside of the support in the factory six cylinder position and will provide ample cooling for the LS2 and Vintage Air system on those stinking hot Aussie summer days.